Did you see The Farmhouse at Emerson Green? 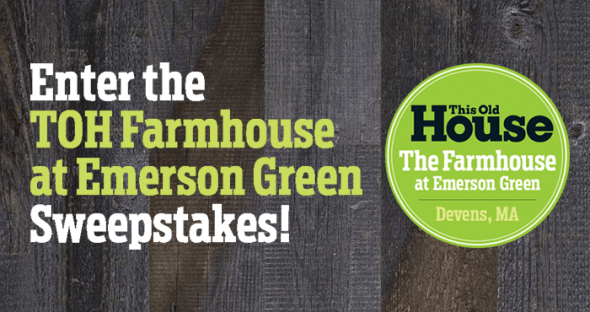 It’s now time to enter the TOH Farmhouse at Emerson Green Sweepstakes for a chance to win up to $8,700 in prizes. Prizes comes from the Farmhouse Partners who helped built the 2016 Idea House showcasing the highest quality and most efficient building products in a sustainable, low-maintenance home. You can enter now through November 4th at ThisOldHouse.com/FarmHouseSweeps by selecting any of the fourteen prizes offered. Entering is fairly easy but you have to make a choice. To do so, visit www.thisoldhouse.com/farmhousesweeps during the Sweepstakes Period then select the prize you’d like to win the most. Then, follow the instructions to complete and submit the online entry form to receive one entry into the Sweepstakes. This Old House Farmhouse at Emerson Green Sweepstakes is open to legal residents of the 50 United States, including the District of Columbia, age 18 or older at the time of entry. Begins at 12:00:01 AM ET on September 23, 2016 and ends at 11:59:59 PM ET on November 4, 2016. Only one Online Entry per person per day is permitted throughout the Sweepstakes Period. The winner will be selected in a random drawing on or about November 18, 2016 from among all eligible entries received during the Sweepstakes Period. The maximum total approximate retail value of all prizes available to be won is $8,886. Sponsored by This Old House Ventures, LLC, 262 Harbor Drive, Stamford, CT 06902. For more information on the TOH Farmhouse at Emerson Green Sweepstakes, including official rules, visit www.ThisOldHouse.com/FarmHouseSweeps now!